teachers—requiring teachers to provide more nonfiction and informational texts at all grade levels and to shift to a more facilitative style of teaching, and requiring students to use text-based answers to demonstrate comprehension are just a few of them. With new demands come increased pressure, and we know transitioning to CCSS isn’t easy for already busy teachers. We want to make the transition easier. Our new one-day course, Using Shared Inquiry™ with Nonfiction, prepares teachers for the new reading requirements by demonstrating how to use complex texts and improving their questioning strategies so they can make sure their students get the most out of reading nonfiction. The new standards' strong emphasis on nonfiction is a dramatic shift for teachers. CCSS calls for a 50/50 split between informational and literary texts in kindergarten, gradually increasing to a 70/30 split in high school. Reaction to the focus on nonfiction varies, but we at the Foundation agree that reading nonfiction is important for all students. Nonfiction helps students better understand a topic, issue, or problem by providing information—facts, terminology, and definitions—that make the subject real. While fiction helps students understand the universality of human emotion and experience, nonfiction exposes them to the broader context of real world issues. Reading more informational texts and nonfiction may engage reluctant readers and boost their interest in reading. Students who are quick to label fiction boring may be drawn to books about subjects that interest them—and after reading a book about snakes, music, or American Indians they’re likely to find fiction that refers to these subjects more fascinating and relevant. 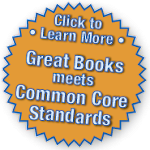 We don’t perceive the new nonfiction mandate as a challenge to the importance of reading fiction—we see it as affirmation of the importance of providing students with a variety of texts to improve reading comprehension, and Shared Inquiry has long provided students with the reading strategies and skills CCSS now demands. Educators accustomed to using Shared Inquiry with fiction may wonder how an inquiry-based method of learning works with nonfiction. The answer is simple: questioning engages students more closely with what they read, including nonfiction and informational texts. Quality nonfiction is much more than a resource of facts: quality nonfiction is an exploration and discovery of a new subject. When teachers use questioning strategies, students explore and discover on a deeper level. Complex texts that raise questions requiring students to read closely to answer them are particularly well suited for Shared Inquiry—texts such as historical documents, speeches, and first person accounts. Consider these questions about the Declaration of Independence: “Why do the colonists feel a need to proclaim to the world their reasons for declaring independence?” and “Why are the inhabitants of the thirteen colonies able to think of themselves as ‘one people’?” (from The Will of the People: Readings in American Democracy). Asking students questions like these about nonfiction and informational texts takes them from simply learning and filing away new facts to examining and reflecting on issues behind the facts. Using Shared Inquiry with Nonfiction will benefit teachers familiar with Shared Inquiry and those new to the method. The course demonstrates how to adopt an inquiry stance with nonfiction and informational texts, how to use questions to explore the meaning of the content to which the text refers, and how to link related texts to differentiate for various students and foster cross-curricular connections. For example, If You Lived at the Time of the American Revolution (a book in our Grade 4 Nonfiction Library), introduces rich content issues—such as freedom and equality—to students learning about the significance of the Declaration of Independence in their social studies class. This is an example of a book that can help address questions students raise during a sharing questions activity about the Declaration. Even fourth grade students can formulate and answer their own questions about complex issues such as freedom and equality. And developing those strategies early on can improve their reading comprehension and critical thinking skills across the curriculum. Using Shared Inquiry with Nonfiction will demonstrate how to make questioning a part of all instruction and will show how Shared Inquiry requires students to provide text-based answers. skills—reading comprehension, writing, and critical thinking—remain a primary focus year after year. Shared Inquiry has been improving those essential skills since 1962 and CCSS provides a new opportunity for teachers and students to realize its benefits across the curriculum. Contact a Great Books sales representative to host a Using Shared Inquiry with Nonfiction course in your district or to find a course near you. Great post, but wish there were postings on a more regular basis.